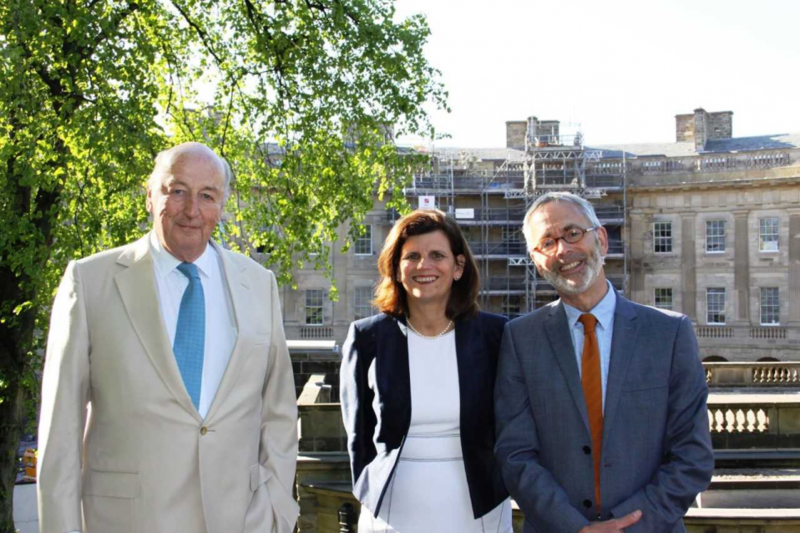 Over 100 guests including founding Friends of the Buxton Crescent Heritage Trust, supporters, funders and volunteers joined the Trust Patron the Duke of Devonshire and Chairman James Berresford at a reception and presentation in the Pump Room on 22 May. The Duke thanked founding Friends and volunteers for their valuable support and acknowledged funding from the Bingham Trust which has enabled the Trust to deliver some key aims including volunteer training, development of the oral history project and the delivery of a programme of events over the past year attended by over 10,000 people. Funding and support from The Heritage Lottery Fund, High Peak Borough Council and Derbyshire County Council was highlighted by James Berresford who also discussed plans for the innovative new Visitor Experience due to open in the Pump Room and Suite of Rooms in the Crescent in 2019. “The event enabled the Trust to thank key supporters who are helping us to achieve our many aims including celebrating and preserving the history of the Crescent and Pump Room, it’s fascinating characters and towns rich spa heritage. Ongoing support, funding and interest is crucial during this exciting phase which includes plans being finalised for the Visitor Experience and the development of our education programme,” added James Berresford. Professor Kathryn Mitchell, Vice-Chancellor of the University of Derby, also attended the event to announce a new partnership between the Buxton Crescent Heritage Trust and the University, which includes working together to enhance the new Visitor Experience leading to more opportunities for students and university staff. “I am delighted to embark on this five year working partnership with the Buxton Crescent Heritage Trust, which will enable us to celebrate our shared heritage and have a positive impact on the profile of our campus, the town, and its tourist offering. Guests also enjoyed live music by Buxton’s Mad Hatters Young People’s Choir, harpist Alice Kerwin and violinist Helen Bloomfield. Local models brought the Pump Room’s past to life in original Victorian and Edwardian costumes provided by Hope House Costume Museum. For further details on the aims and plans of the Trust, events in the Pump Room this summer, the Friends and Volunteer schemes please visit www.buxtoncrescenttrust.org.